Neustar operates the .US ccTLD domain registry. I don’t see .US domain names used very often, and I don’t believe the .US ccTLD is used nearly as regularly as ccTLD domain names in other countries, especially those in Europe. I don’t recall ever seeing mainstream marketing for .US domain names until this weekend. 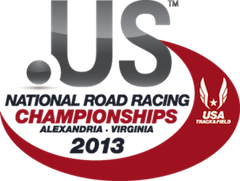 To culminate the 2013 USA Running Circuit (USARC) season, in February USA Track & Field announced its biggest single-event sponsorship in more than a decade when it launched the .US National Road Racing Championships. It’s the beginning of a three-year deal between USATF and Neustar, the administrator of the .US top-level domain, to initiate and grow a national-championship, mass-production road race. I am not sure if this is a one-off sponsorship or if we are going to see more promotion of the .US ccTLD. It wouldn’t surprise me if we begin seeing legacy TLDs advertising more as the new gTLD domain names roll out. There will be a lot of money spent on consumer awareness campaigns, and tieing the .US TLD with this race was pretty neat. It will be even more momentous when Neustar sponsors the annual US Open tennis tournament. .US has been overshadowed by .COM in the US. ccTLDs in other countries are going strong.